Three young Cherokee traveled on a diplomatic trip to England. One of three men was Oukanaekah, who was later given the name Attakullakulla, or Little Carpenter, which means “one who fits things together nicely.” This describes an effective style of leadership, and not necessarily his occupation. An earlier 1721 treaty with South Carolina normalized trade and established a fixed boundary between the Cherokee and the colony. Although allied with the British, the Cherokee began to favor the French, who showed greater respect for the Indians and had established a fort in present-day Alabama. To prevent a Cherokee alliance with the French, Sir Alexander Cuming visited the leading Cherokee towns and convinced them to select an “emperor”, Chief Moytoy of Tellico, to represent them in all dealings with the British. 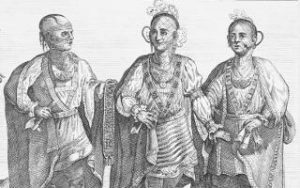 Cuming escorted seven Cherokees to England (but not Chief Moytoy), who met with King George II on June 22, 1730 and swore allegiance to the crown. In a treaty signed in Charleston in 1743, they agreed to trade only with the British, return runaway slaves and expel Non-English whites from their territory, and the Cherokee received substantial amounts of guns, ammunition, and red paint. Although presented to the King as “chiefs”, only one of the Cherokee could be considered prominent – the others were young men who went on an adventure. The other chiefs declined due to their responsibilities for hunting and war, except for Attakullakulla, who later became a powerful and influential chief.